Walter Vollrath's vintage racing debut could not have gone smoother. 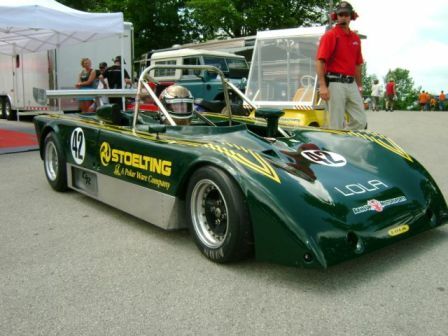 After a two-year restoration, the Elkhart Lake resident's 1978 Lola T497 ran the entire weekend without a problem. Vollrath, who has logged several miles around the Road America track, had not sat in the car until opening practice of the Kohler International Challenge. Gaining knowledge with the car each time on the track, Vollrath drove to a fifth-place finish in the 70's sports racer category at the prestigious KIC. "This was a great event for our team," Gregg Borland said after the Kohler International Challenge. "It was great for Walter's Lola to run so well straight out of the box. That is going to be a fun car to work with for the rest of the season. We can only get quicker with the car as Walter gets more comfortable." After visiting the past, ArmsUp Motorsports returned to the Road America circuit for the SCCA Cat National with four Formula Continentals and one Formula Atlantic. Revere Greist once again led the Formula Continental charge with a third-place finish after a race-long battle for the second spot. Kirk Kindsfater, who had been fighting the stomach flu most of the weekend, drove to a well-deserved fourth-place finish. John Greist claimed a seventh-place finish after an electrical gremlin restricted his pace during the qualifying session. John Dickmann was forced wide in the Carousel early in the FC race but was able to recover to bring home an eleventh-place result in the number 60 EVScorvette.com car. Jose Paredes bounced back from a difficult June Sprints weekend to score a podium finish in the Formula Atlantic category. After qualifying fifth, Paredes was able to move up to the third position in his ArmsUp-prepared Swift .014. "This was a solid Cat National for us." Borland said from the team's hospitality unit. "Our SCCA Club effort continues to make progress. Revere did a great job and keeps getting better in the Van Diemen. Kirk, John Greist and John Dickmann all had to overcome different difficulties this weekend and did so really well, I'm proud of all of them for dealing well with the adversity." Just one week after the Cathouse National, ArmsUp Motorsports once again returned to the 14-turn Road America track, this time for the F2000 Championship Series Presented by Hoosier Racing Tires. Revere and John Greist would be joined by ArmsUp newcomer Rick Balsley for the team's return to pro racing. The double-final event would have its share of ups-and-downs as the team fought rear upright problems, resulting in the lost of valuable test time. Race one was an abbreviated affair as caution periods in the timed race allowed merely two laps of green flag running. Even with the lack of green conditions, Revere Greist was able to move up 16 positions from his 27th starting spot to eleventh. John Greist and Balsley were also able to capitalize on the yellows with each driver moving up from their starting spots to finish 17th and 24th respectively in the 40-car field. Race two would show the true form of the ArmsUp cars with the younger Greist bringing home a third-place result when it was all said and done. Coming from eighth on the grid, Greist battled his way forward to score his first professional podium finish in his second start. Rick Balsley, who had not sat in a Formula Continental car before Thursday's test day continued his steady progress to finish 16th in race number two. 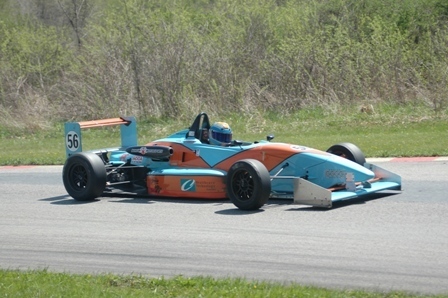 The podium finish for Greist was ArmsUp's third podium-finish in four starts in the F2000 Championship, dating back to Steve Welk's double podium in 2006 with the ArmsUp squad. "Revere did a great job today and showed what caliber of team we truly have," Borland commented at the end of the F2000 weekend. "We weren't able to test much on the radial Hoosiers, and by the end of the weekend we were running with the best in the series. Our crew worked really hard to overcome the upright problems we were having so my hats off to them. I want thank Rick Balsley for coming out and running, he did a great job and didn't put a wheel wrong all weekend in his debut in these cars." ArmsUp Motorsports will now take a short break before the team returns to Road America later in the month for more testing at the four-mile circuit. Formed in 1995, ArmsUp Motorsports is one of the premier SCCA Formula Continental and Formula Atlantic racing teams. Based in Elkhart Lake, Wis ArmsUp Motorsports is a full service prep shop for Formula Continentals, Formula Atlantics, and Vintage racing cars. For more information please visit the official ArmsUp website at www.ArmsUpMotorsports.com.